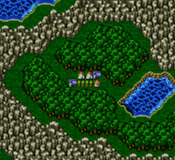 Like most of the denizens in Final Fantasy V, the residents of Moore speak about the surrounding land, namely the forest to the east, with reverence bordering on fear. Of course, they can’t stroll through the forest since they don’t have the Guardian branch (that you should have gotten from Ghido’s Cave) so their attitude is justified. The Oktoberfest sized pub brims with people eager to share their thoughts on their forest. They talk fondly about trees’ spirits. One resident even claims to have been rescued from the forest by a moogle. It could be he’s had a bit much ale. He’ll be angry when he realizes the bartender is to be mia. Strike up a tune before you leave. At least you no longer scare the patrons out of the bar when you play. Just a little more practice and you’ll give Beethoven a run for his money. You know how these hole-in-the wall inns are. You pay more money for fewer amenities. The price has been hiked up to 70 Gil a night. But it beats a free night holed up in the submarine…or does it? These two seem to follow you everywhere. They always carry the same herbs and potions for the same prices. No sales on Maiden Kisses for outbreaks of Frog Song. No “Cottages, now 25% bigger!” You’ll take it or you’ll leave it, but it’s the same as any other town. I don’t know where this armorist learned his craft, but this guy carries wonderful goodies. You can now ditch your tacky Golden Armor in favor of a set of diamond (Can you say Bling?). He even carries two different types of diamond body armor. The heavy Diamond Armor (weighing in at 8) has 3 better def than the Golden Armor. Unfortunately it doesn’t carry any other perks. The Diamond Plate is a better choice for some of your semi-physical fighters with 13 def and 2 mdef. Like its heavyweight counterpart, it doesn’t boast any other stat bonuses. Your mage gets some great mpwr boosting equipment. The Luminous Robe raises mpwr by 2 and mdef by a whopping 12! All of your spellcasters need this. It matches splendidly with the Sage’s Miter, which also raises mpwr by 2. On the hill behind the armor shop stands the weapon shop. This community must be of the opinion that the best offense is a great defense because they don’t carry much in the way of weaponry. This is not to say that their equipment is bad, just that the selection is Spartan. They only carry two weapons. They carry the Air Knife, which boasts an atk of 53. As an added bonus it inflicts wind-elemental damage. This is the hardest hitting knife to date. But if you don’t have the cash to pick it up you can steal them from Moss Fungus enemies later in the game or even find one at Istory Falls, but not until much later. The other weapon sold in Moore is the Elven Bow. It has the same atk as the Air Knife, but doesn’t have any spectacular attributes. Still, it’s a step up from the Killer Bow for your Ranger. Nestled in a small hollow in the back of the town, three unsuspecting merchants sell some powerful magic. You can finally purchase the level 5 spells for white, black, and time mages. I obviously suggest you purchase all of them, but this can be a costly shopping trip since each spell costs 6,000 Gil. If nothing else purchase Curaga. Healing is always a top priority. Reflect can come in handy for reflecting magic back at spellcasting enemies, but Berserk doesn’t have many uses. I can’t advocate the purchase of one black magic spell over another. You really need a full set to compliment your boosted mpwr. I don’t employ a time mage as often as the other two, so if you can’t afford all the magic I suggest holding off on the time spells. For the time being Moore holds only one secret treasure. Two barrels lean against the western wall outside of the pub. Check the bottom barrel to claim a Main Gauche. Later in the game the small building south of the pub will be accessible. If you explore check the back of it now you’ll find a locked door on the back wall. Tuck the thought of it in the back of your mind. After all of completing your manic purchases you can continue your journey in the Great Forest of Moore to the east of town.